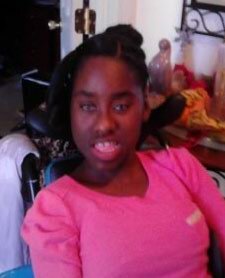 Adia is an 18 year old girl who has cerebral palsy. She’s non verbal and is in a wheelchair. Deedee loves going to school ,listening to music, watching old black and white movies and spending time with her siblings and her family. Child needs clothes, tops, pants, boots and shoes. Winter coat. Bedding set, latex gloves,bed pads and wipes. Deedee loves watching movies, portable car multi screen player, books and arts & crafts things.